Harriotte Lane. Picture by Michelle Mercer Photography. A teenager is continuing her work raising money for local charities. Harriotte Lane, from West Allotment, is currently fundraising for Together for Short Lives, which fund hospices in the region who help with end of life care for children. 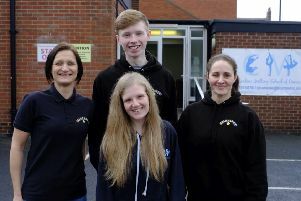 The 14-year-old, a pupil at King’s Priory School in Tynemouth, put her modelling skills to work and hosted a charity studio day, raising more than £600. Now she has teamed up in partnership with Startastic, a local company that provides Disney characters for children’s parties along with dance and fitness classes. They are putting on a magical ball for small children, who will have the chance to meet their favourite characters, sing, dance and play games. The event is taking place on Monday, May 25, from 10am to noon at the Kingdom Hall in Whitley Bay. All money raised is going to the charity with staff from Startastic donating their time while the venue is not charging a fee.